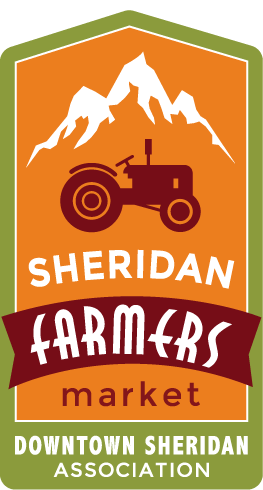 All booths must be staffed during all hours of operation for the Sheridan Farmers Market. 2019 SFM Policies and Procedures. In order to be assigned a permanent space at the market, you must prepay. See the Fees section below. You are most welcome to participate on a week to week basis if you cannot prepay for the season. Spaces are available on a first come, first serve basis. The cost is $20 per booth (10′ by 10′ space) per market event. Prepay for the entire 13 market season and receive a special discount rate of $200. Refunds will only be given under extreme circumstances and are at the discretion of the Sheridan Farmers Market if you prepaid but miss a market. We do not give refunds due to uncooperative weather. This feature is provided for vendors who pay for the entire 13 market season. Infromation can be submitted with your Vendor Application or emailed separately. You MUST be a PAID season market vendor to participate in the Vendor Directory.